1. Why are 41 properties in the northeast corner of San Pareil not connected to the community water system? To the best of our knowledge, the decision to exclude the properties on Juniper Road, Cypress Road, and parts of Shorewood Drive from the community water system was made in the 1970s. The water system was privately owned and operated at the time, and it's possible that these property owners were content with their own drinking water wells and did not want to pay for community water service. 2. Is there enough water to allow more connections? The addition of 41 homes or approximately 92 people is estimated to increase the annual water demand by 16,600 m3/year (approximately 15%), to a total of 128,500 m3/year. Historical operating records indicate that the San Pareil Water System has produced up to 137,600 m3/year. In this regard, the existing water supply is deemed to be adequate to support the addition of the 41 unserviced properties. 3. What’s the plan to connect these 41 properties? A number of owners from these unserviced properties have recently expressed interest in joining the community water system. A group project is being proposed at this time, to expand the existing boundaries of the San Pareil Water Service area if the 41 property owners are agreeable to pay annual taxes and user fees for community water service, and pay an equal share of the costs to construct watermains in the roadway. •	The petition will contain the options for payment of construction costs to install watermains on Juniper Road, Cypress Road, and part of Shorewood Drive (see map attached). 5. What is a petition? A petition is the formal means of getting written support from property owners to extend the existing San Pareil Water Service Area, and to approve the means of funding the construction of the new watermains. As with other infrastructure projects, the RDN is able to borrow the funds required from the Municipal Finance Authority, and pay it back through tax requisition from the 41 San Pareil property owners engaged in this project. 6. How does a petition pass/fail? The petitioning process succeeds if at least 50% of the property owners petitioned return a valid signed petition, and the value of the valid petitions makes up at least 50% of the assessed value of the properties being petitioned. Without this approval the RDN cannot undertake the construction work. 7. Do I still have to pay if I don’t want to join the water service area, but the rest of the neighbourhood does? Yes. If the majority (50% +) of the property owners within the proposed service area agree to the construction by signing the petition, then all of the property owners within the proposed service area would pay for the cost of watermain installation. 8. Do I have to connect to the new water main? No. Property owners are not required by the RDN to connect to the new watermain in a specified time frame. It is recognized that some property owners are satisfied with their own drinking water wells, or have other arrangements. However, as per Question (6) above, all property owners within the successfully petitioned water service area will pay for an equal share of the construction cost whether they connect to the water system or not. Property owners who choose to connect will have other costs as described in Question (11) below. 9. Has the RDN experienced successes or failures at the petitioning stage in other projects? Yes. 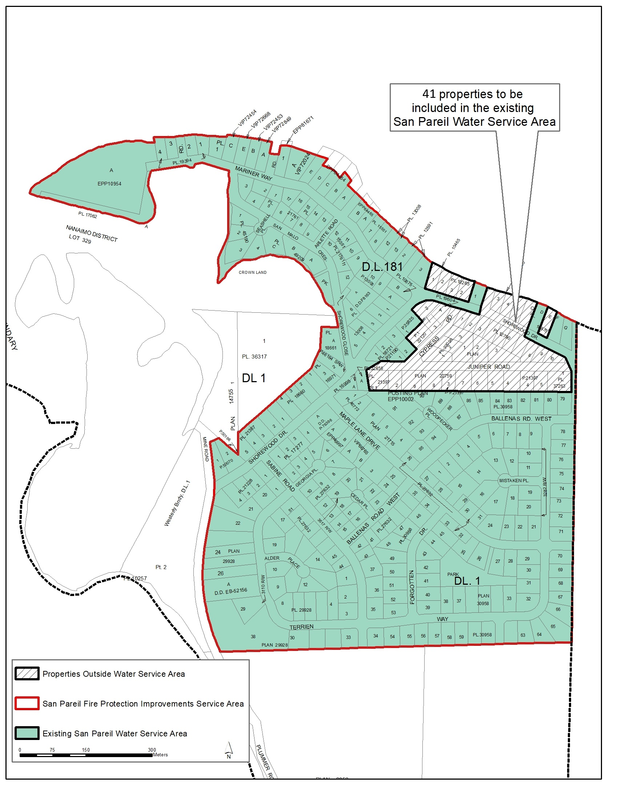 In recent years, the RDN has been petitioned to expand the water service areas in French Creek and Nanoose Bay by property owners who are located near the existing water infrastructure. The results have been mixed. In each case the property owner(s) were advised of the costs and process to obtain a community water connection, with the costs being specific to each area/project. Some have failed to proceed due to lack of petition support. Other water projects have been completed with the required level of support, and the property owners have successfully connected their properties to the RDN water system. 10. What is the whole process: public meeting/petition/board approvals, etc? After the public information meeting, RDN staff will prepare the formal petitions for mailing. The formal petitions can only be completed by the registered property owners, not tenants. A few weeks’ time is allowed for review/return of the petition. Once the specified petitioning deadline has been met, the petitions are tallied and the results are presented to the RDN Board of Directors (the “Board”). A report would be prepared for the Board indicating the level of petition support, along with a recommendation to proceed, or not. If the recommendation is to proceed, and the Board approves it, then the boundary of water service area bylaw is expanded, and a borrowing bylaw is prepared. Once these bylaws are adopted and approved by the Inspector of Municipalities (in Victoria), the RDN can issue a public tender (competitive bidding process) for the construction portion of the project. Assuming the tender responses are within the budgeted amount, the project can be awarded and the watermain construction can commence. 11. What is the estimated cost per property for the proposed water system expansion? 12. What happens if the project is finished and the construction cost comes in under budget? If the project costs come in under budget, then the cost to each owner will be less. Each property owner will pay an equal share of the actual costs to complete the project, and will not exceed the amount specified on the petition. 13. What happens if the final construction cost is higher than what was estimated? The engineering design is the basis of the project cost estimate, which was calculated using local, recent, actual construction prices. When the project is tendered to the public, competitive bids are received, and it is rare that they all come in above the project cost estimate (the project budget). However, if the construction costs come in higher than what was written on the petition, then the RDN must go back to the participating residents to get approval again (or not) before work proceeds. 14. Can we secure grant funding first and then, if successful, proceed with the petition process for the expansion? There are no provincial or federal grants available for this type of project, at this time. However, a request will be made to the RDN’s Electoral Area “G” Director for the use of Community Works Funds towards the capital costs of the San Pareil watermain expansion project. 15. How long would the construction be expected to take? Construction of watermains in the roadway is expected to take 2 months from the date it begins. 16. What are some of the risks and how has the RDN planned to mitigate them? There are unknown factors in every construction project. RDN experience with other similar projects has led to a number of checks and balances in the planning stages of each project. The survey and design work has been completed by a local civil engineering company, with recent experience in watermain construction projects. With the design work already complete, the RDN would publicly tender the construction portion of the project, so the lowest price is achieved. We have factored-in some costs for archaeological services, as well as a contingency for things like dewatering and delays due to inclement weather. 17. Why do we have to pay for the watermain construction costs, doesn’t the RDN have the money? The RDN does not have a general expense account for construction of watermains in new areas. In the Regional District, the cost of a service is paid for directly by the benefitting participants only. The RDN would not charge the existing San Pareil Water Service Area customers the costs to install water mains in new areas. 18. How is the project financed? The RDN is able to borrow the construction funds through the Municipal Finance Authority (MFA) at the current market rates available at the time of borrowing. The rate used for estimating costs in this project was 3.5%, but it may be lower or higher depending on whether long term borrowing rates change before the actual borrowing is completed. The rate will be fixed for 10 years at a time, although the borrowing will likely be amortized over 20 years. The rate for the second 10 year period is set when the debt is renewed at the end of the first 10 years. Recent borrowing from the MFA for another project was at 3.15%. 19. How do property owners pay their share of the construction project? The RDN will provide property owners with two options for payment. Payment would be either added to each property owner’s annual parcel taxes as a new parcel tax, or property owners could pay their share up front before borrowing is done. This is referred to as a “lump sum” payment. In either case, the amount owing is calculated once the project construction is complete and all costs are accounted for. 20. Can you explain the Capital Charge of $7,386.30? The value of the existing water system assets has been used to calculate a fair “buy-in” cost to new water system customers, called a Capital Cost Charge. This charge, of $7,386.30 per property, was adopted by the RDN Board of Directors in January 2019 and will be payable by the property owners who join the community water system. Property owners will be requested to pay the Capital Charge at the time their properties are included within the water service area (before construction begins). The payments will be tracked, and if left unpaid, the Capital Charge would eventually be applied to a property owner’s building permit at the time he/she requests a connection to the water system. 21. Will my taxes go up? Yes, but only for the 41 new properties added to the water system. There is a parcel tax for water service (already in place for existing San Pareil Water System customers), which would be charged to all the new properties included in the expanded service area. This parcel tax is used to pay for the daily operation and maintenance, and eventual replacement costs of the existing water system. In 2018, the parcel tax for San Pareil Water was $479.98/yr per property. A separate parcel tax for repayment of the construction portion of the Cypress/Juniper/Shorewood project as noted in Question (19) above would be charged to all the new properties included in the expanded service area. On a positive note, if the number of properties in the water service area increases, the annual parcel tax may actually decrease, since the cost to operate the community water system is shared amongst a greater number of property owners. 22. Can we defer our parcel taxes? Maybe. 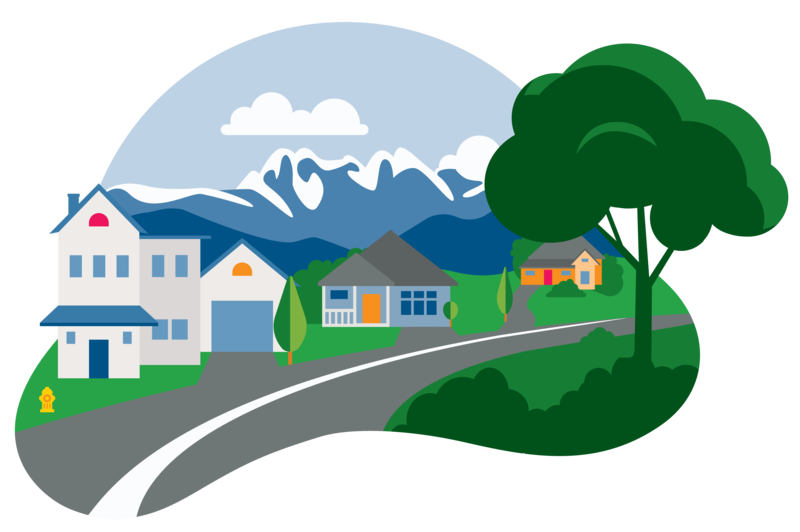 There are a number of property tax deferral programs available through the Province of British Columbia, including ones for persons over 55, persons with disabilities, and for families with children. More information about the provincial Property Tax Deferral Program is available on the web at www.gov.bc.ca/gov/content/taxes/property-taxes/annual-property-tax/defer-taxes or through a Service BC Office. Semi-annual metered water use charges cannot be deferred (see next question). 23. Are there other costs once the service is established? Yes. Each property connected to the San Pareil Water System will be fitted with a water meter at the curb. Water meters are read by RDN staff twice per year, in May and September. The water usage charges would appear on an RDN Utility Invoice, around June and October of each year. A typical San Pareil household pays $150 - $250 for 6 months of water use. While the water main construction will take place in the roadway, property owners will be required to install a water service line across private property to connect to the (potential) new water mains. Property owners are responsible for the costs to hire a backhoe contractor and install this water service line. Currently no known archaeological sites are documented in the proposed water main expansion area. Since this area has a high potential for undocumented archaeological sites, the RDN will ensure that archaeological work occurs during water main construction. There may or may not be additional archaeological costs related to individual water service lines on private property. Residents are advised that the Heritage Conservation Act must be followed. Questions regarding the permitting requirements for private property can be directed to the provincial archaeology branch at ph. 250-953-3334.